The 2008 season of e² is presented in two parts, "e² design" and "e² transport", and will visit Cairo, Nova Scotia, Melbourne, San Francisco, London, Paris, Amsterdam and Seoul. Featured interviews include luminaries like acclaimed author Michael Pollan, His Highness the Aga Khan, and Pritzker Prize-winning architect Renzo Piano. kontentreal is a documentary film and strategic entertainment company dedicated to telling stories about innovators and pioneers who envision a better approach to life on earth. Headquartered in New York, the company was founded in 2003 by advertising veteran Karena Albers and filmmaker/cinematographer Tad Edward Fettig. kontentreal debuted its first episodic series on PBS, "e² design", in the summer of 2006. Now entering its fourth season, e² continues to traverse the globe, covering sustainable practices in design, energy, transport, water, food and urban development. kontentreal’s team of esteemed visual storytellers, producers and marketers seek out stories about creative, tangible solutions to environmental challenges, particularly those that transcend geography and culture. 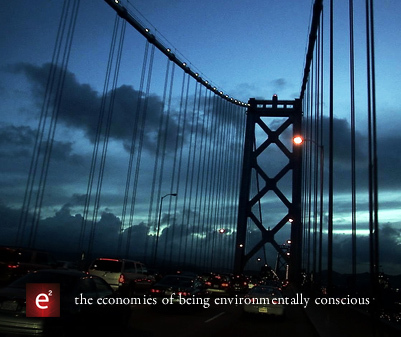 Past episodes of e² have profiled Nobel Peace Prize-winner Muhammad Yunus’s efforts to bring renewable energy to Bangladesh’s rural poor through micro-finance; William McDonough and his “cradle-to-cradle” design philosophy; and former Bogotá Mayor Enrique Peñalosa’s sweeping redesign of that city’s transportation network, emphasizing alternatives to automobile culture. kontentreal has also produced "Ecoists" for the Sundance Channel, "Generation G" for Live Earth’s SOS Short Films Program, and has several other independent film and television projects in development. Director of Photography Rob Humphreys and Director Tad Fettig shooting at the "Big Dig House" in Boston, Massachusetts, fall 2005. After 20 years of brand-building experience in traditional advertising, Karena has refocused her energies on film projects that celebrate environmental leadership and the indelibility of the human spirit. Past projects include "Roadtrip Nation," an ongoing series for PBS; "Guitar," a documentary film project; "Generation G," a short film for the 2007 Live Earth concert; and "Ecoists," a series of interstitials for the Sundance Channel. Karena created the e² series in conjunction with her business partner, Tad, and is currently developing episodes about transportation for the 2008 season. Seeking relief from the confines of the advertising industry, Tad created kontentreal in 2004 with his fellow advertising expatriate, Karena, combining their commercial experience with his love for documentaries. Beginning in fall 2005, Tad spent most of the next 15 months filming the first two seasons of e². In 2006 and 2007, Tad and Karena directed "Ecoists" for the Sundance Channel. Previously, Tad produced the feature "Dopamine," which premiered at the 2003 Sundance Film Festival; directed and shot "Guitar," a documentary film; and directed and shot "Ausangate," a documentary about the Quecheun Indians in the highlands of Peru. He recently completed work as a director of photography on "Woven Songs of the Amazon" in Peru and "Food Will Not Feed my Soul" in Liberia. He continues to pursue documentary projects across the globe. Rob is a Zimbabweean-born cinematographer now living in Los Angeles, California. He shot nearly every e² episode to date, beginning with its 2006 inaugural season. Rob's other recent projects include Eric Byler's "Americanese" and Rodrigo Gonzalez's "Entre Canibales." He also shot the critically-acclaimed "Charlotte Sometimes" (2002), nominated for two Independent Spirit Awards. To date, the films Rob has shot have garnered over 20 awards internationally. He studied film and photography at Emerson College and the School of the Museum of Fine Arts in Boston. Elizabeth is a New York-based documentary filmmaker who has been series producer on both seasons of e². She previously directed and produced the hour-long documentary "A Family Undertaking," which follows several families as they prepare home funerals for their loved ones. The film was broadcast to critical acclaim on the PBS series P.O.V. in 2004 and 2007. Beth also directed and produced "Passing On The Gift," a film that marked the 60th anniversary of the humanitarian organization Heifer International, and she produced numerous stories for the Sundance Channel series "Festival Dailies," among others. She is the owner of Five Spot Films, a documentary production company. Beth is an independent producer who has been with e² since its first season, first as director of development and, for seasons two and three, as senior producer. Previously, she was one of three producers of the HBO series "Classical Baby," which was honored with an Emmy Award for Outstanding Children's Programming and a George Foster Peabody Award. Beth was also a primary creator and the story editor of "EGG the arts show," a national PBS series on the contemporary visual and performing arts. Beth grew up in Massachusetts and graduated from Middlebury College. She and her husband live in New York and are parents to Benjamin and a younger brother, Gabriel. After a bevy of careers in the past 15 years - including media buying and planning, account management, telecom consulting, Web production and a formal education in mechanical engineering - Midori met Tad for a coffee in late 2004 and encountered e² for the first time. She helped develop the series in its early stages, and recently oversaw kontentreal's participation in the American Film Institute's Digital Content Lab. The resulting collaborative project, "The Green Map for Living", is a prototype multi-platform community which incorporates content from e². After bouncing between the west and east coasts more times then she cares to recall, Midori has finally settled in San Francisco and now just "visits" the New York office. Soo got her unlikely start in the film industry with an apprenticeship to an independent director in New York. Logging endless hours of footage, she fell in love with the craft of documentary filmmaking, and what started as a curiosity became her passion. Soo has since pursued her love of storytelling through all genres of television and film, freelancing for networks including HBO, Discovery, MTV and PBS/Thirteen. Sarah Tautin has worked in a variety of media over the past ten years, including public radio, news, long-form and reality TV. Her projects have appeared on CNN, The History Channel, A&E and the Discovery Channel. In 2003 she was was honored with an Emmy nomination for her A&E piece, "The September 11th Attack on the Pentagon." Sarah holds an MSc in international politics from Edinburgh University and a BA in journalism from the University of Wisconsin. Rich's skills as an editor have been deployed in the country's largest creative markets, including New York, Chicago and Los Angeles. His credits encompass broadcast TV commercials, long-form programming and multimedia. In addition to his work on both seasons of e², Rich worked with kontentreal on the "Ecoists" series for The Sundance Channel; "Generation G," a short film for the 2007 Live Earth concert; and "Guitar," a documentary film. After relocating to New York in 2006, he completed an educational multi-screen installation for George Washington's Mount Vernon Museum and Garden. Through entertainment, Richard hopes to pursue subjects that cause viewers to reconsider the ways in which they live. Lars Woodruffe is a New Zealander who has lived and worked in Singapore, London and New York City. An editor for over fifteen years - the last six as a freelancer in New York - Lars has worked on television documentaries for PBS, THC, BBC, C4 (UK) and TVNZ (New Zealand). His recent works include "Act of Honor," a one hour documentary for the History Channel, and "Is God Green?," a one hour Bill Moyers documentary for PBS. Lars holds an O-1 Visa for exceptional ability in the field of editing.